Student’s accommodation for the whole 2019/2020 academic year for the period from September 2019 until June 30, 2020 – Price list. Short-term student’s accommodation for 7 – 30 nights in the period from November 1, 2019 to June 30, 2020 – Price list. Possibilities of the short-term accommodation reservation depend on accommodation capacity at particular term. For the reservation, please send email to: ubytovani@vse.cz. Students with special health requirements concerning their accommodation may approach the Central Accommodation Office, ubytovani@vse.cz. Such requirements shall be processed preferentially and individually. Each applicant for accommodation in a VŠE dormitory submits on-line application for accommodation (hereinafter just „Application“) in the Information System of Dormitories and Student´s Canteens of the Department for the Administration of Facilities of the University of Economics in Prague (hereinafter just „ISKAM“) iskam-web.vse.cz. Other form of application submitting than on-line shall not be accepted. The procedure of application filing is described in a Manual. Present students of the University of Economics in Prague. Applicants enrolled to the first term of Bachelor’s studies or consequent Master’s studies or postgraduate (PhD) studies at the University of Economics (VŠE) in Prague. Students of other universities studying daily form of studies (depends upon free accommodation capacity). Department for the Administration of Facilities reserves a right to terminate student’s accommodation at University hotel dormitory by May 11, 2020 pursuant to Article 4, paragraph 4 of the Dormitory Rules. Accommodated persons may be offered another accommodation depending on the actual accommodation capacities. This provision is reasoned by the need to free accommodation capacity of the University hotel dormitory for accommodation of VŠE Summer Courses participants. Submit their applications in the period from May 2, 2019 to June 27, 2019 using iskam-web.vse.cz in the waiting list VŠE Praha studenti 2019/2020 – students 2019/2020. The application may be submitted also after June 27, 2019. However, such persons lose the possibility to choose their room; the accommodation is allocated by the Central Accommodation Office, depends upon free accommodation capacity. Student of VŠE, who submit their application after June 27, 2019 have no priority over student of another school. This group of applicants includes also students who directly continue from their Bachelor’s studies to Master’s studies. Only the applicant accommodated in a particular room during the whole period May 1 – June 27, 2019 may apply for the same room and their application must be submitted by June 27, 2019 at the latest. At the time of submitting your application, you may not have finished your accommodation! The room will be displayed automatically in the system. If the applicant is not interested in the same room, he/she may cancel this preference in the ISKAM system. If there is not number of the room, student has to contact Central Accommodation Office. The applicant is not entitled to the same room as in the academic year 2018/2019. However, the Central Accommodation Office shall make efforts to satisfy his/her request. The assigned accommodation depends upon the date and time of application (earlier applications are processed first). The choice of a room by students shall take place in the time determined in the Timetable. The possibility to choose the room shall be provided only to those students who submit their application by June 27, 2019 and pay the reservation deposit. The Central Accommodation Office reserves a right to change the room chosen. Any written annexes to the Application (e.g. medical) must be delivered to the Central Accommodation Office by July 5, 2019 at the latest. Information whether the student was accommodated or not (application pre-satisfied) will be accessible on iskam-web.vse.cz in the Accommodation – Accommodation requests (waiting lists) by July 16, 2019. In case that the chosen room cannot be provided, the Central Accommodation Office will provide other adequate room. Information concerning the particular allocated dormitory and room shall be accessible on iskam-web.vse.cz, in the „Accommodation – Accommodation List” card by August 17, 2019. Both partners must be the University of Economics students. Shall submit their applications in the period from May 2, 2019 to June 27, 2019 using iskam-web.vse.cz in the waiting list VŠE Praha studenti 2019/2020 – students 2019/2020. Together with the application, i.e. by June 27, 2019 at the latest, each partner shall send an e-mail stating name, surname and IDIS of his/her partner to ubytovani@vse.cz. IDIS means an identification number to be found in the Integrated Student Information System (InSIS). The applicants for the shared accommodation cannot choose a particular room. Rooms shall be allocated by the Central Accommodation Office. As the confirmation of serious interest in accommodation in the VŠE dormitory, the applicant shall pay the reservation deposit in amount of CZK 5 000 to the benefit of the bank account no. 1793102/0800 by June 27, 2019 at the latest. If student has paid accommodation deposit and submit application, accommodation deposit will transfer to reservation deposit. The reservation deposit will be transfer at the accommodation deposit on the date of move-in the latest. The accommodation deposit, or its part, may be used to cover any damage, debt or possible sanctions. The deposit will be returned when you move out in cash or by card at the dormitory office, or within 30 days after to the bank account you state in your ISKAM profile (for the foreign payment must be add administration fee CZK 500). The deposit may be also left at your ISKAM account for the next academic year. Cashless bank transfer to the benefit of the bank account no. 1793102/0800. For identification of your payment use the variable symbol (VS). Each applicant shall find such VS in iskam-web.vse.cz in the Basic Information card (for the foreign payment must be add administration fee CZK 500). Payment via a payment portal in the ISKAM system. Card Accounts – Accommodation deposit – Charge. Pay by card at a reception desk of any dormitory. Detailed information regarding the reservation deposit payment will be sent to your email after applying for accommodation at iskam-web.vse.cz. 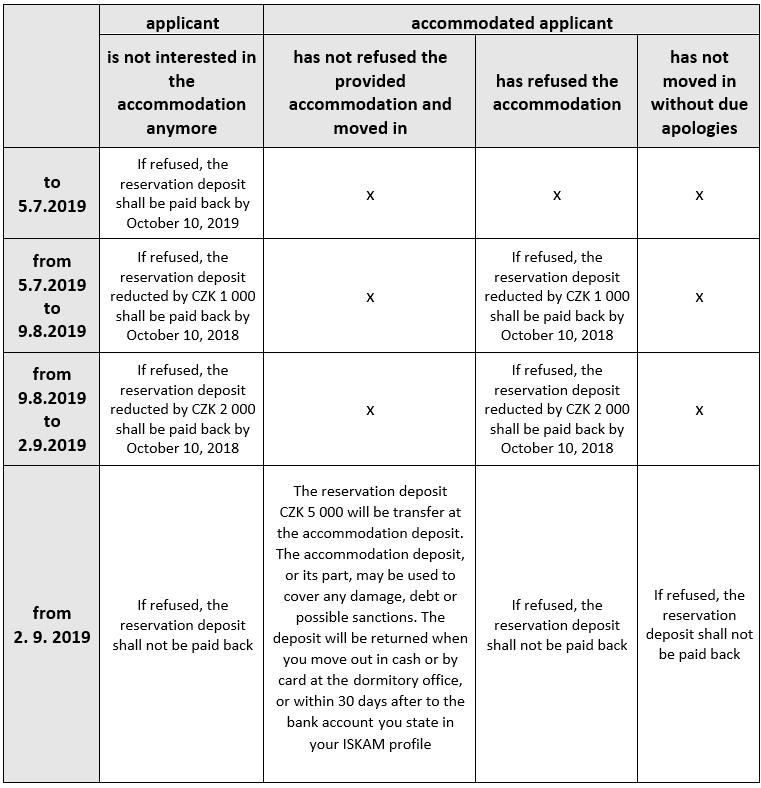 If the reservation deposit in the amount of CZK 5 000 is not paid until June 27, 2019 the reservation will be cancelled. Submit their applications in the period from May 2, 2019 to July 2, 2019 using iskam-web.vse.cz in the waiting list VŠE Praha studenti 2019/2020 – students 2019/2020. Applicant’s registration in ISKAM is possible one day after enrolment for the studies at VŠE, using the allocated user’s name and password for log-in into the Integrated Student Information System (InSIS). The accommodation may not be booked before the enrolment for studies at VŠE. The applications shall be satisfied according to the date and time of submission in ISKAM and payment of the reservation deposit of CZK 5 000. Priority in allocation of the accommodation is given to the applicants with the reservation deposit paid. The choice of a room by students shall take place in the time determined in the Timetable. The possibility to choose the room shall be provided only to those students who submit their application by July 2, 2019 and pay the reservation deposit. The Central Accommodation Office reserves a right to change the room chosen. The application may be submitted also after July 2, 2019. However, such persons lose the possibility to choose their room; the accommodation is allocated by the Central Accommodation Office. The applicant repeatedly enrolled for the first term of the Bachelor’s studies or consequent Master’s studies is not entitled to get the same room as the one he/she used in the academic year 2018/2019. The student of the postgraduate (PhD.) studies, who has not obtained his/her registration data yet, send a message till July 15, 2019 regarding the requested accommodation and moving-in date to ubytovani@vse.cz in advance. shall submit their applications in the period from May 2, 2019 to July 2, 2019 using iskam-web.vse.cz in the waiting list VŠE Praha studenti 2019/2020 – students 2019/2020. Together with the application, i.e. by July 5, 2019 at the latest, each partner shall send an e-mail stating name, surname and IDIS of his/her partner to ubytovani@vse.cz. IDIS means an identification number to be found in the Integrated Student Information System (InSIS). As the confirmation of serious interest in accommodation in the VŠE dormitory, the applicant shall pay the reservation deposit in amount of CZK 5 000 to the benefit of the bank account no. 1793102/0800 by July 2, 2019 at the latest. The reservation deposit will be transfer at the accommodation deposit on the date of move-in the latest. The accommodation deposit, or its part, may be used to cover any damage, debt or possible sanctions. The deposit will be returned when you move out in cash or by card at the dormitory office, or within 30 days after to the bank account you state in your ISKAM profile (for the foreign payment must be add administration fee CZK 500). The deposit may be also left at your ISKAM account for the next academic year. If the reservation deposit in the amount of CZK 5 000 is not paid until July 2, 2019 the reservation will be cancelled. The applicants admitted to studies at VŠE upon the Request for Revision of the Non-acceptance Decision after July 1, 2019 as well asstudents passing the entry exams after July 1, 2019 or enrolled for studies after July 1, 2019 may file their applications for accommodation since one day after the date of their enrolment for studies until August 28, 2019 using https://iskam-web.vse.cz/ in the waiting list VŠE Praha studenti 2019/2020 – students 2019/2020. Applicant’s registration in ISKAM is possible one day after enrolment for the studies at VŠE, using the allocated user’s name and password for log-in into the Integrated Student Information System (InSIS). The accommodation may not be booked before the enrolment for studies at VŠE. The applications shall be satisfied according to the date and time of submission of the application in ISKAM and payment of the reservation deposit of CZK 5 000. Priority in allocation of the accommodation is given to the applicants with the reservation deposit paid. Rooms are allocated by the Central Accommodation Office, applicants cannot choose a room by themselves. The applicant repeatedly enrolled to the first term of the Bachelor’s studies or consequent Master’s studies is not entitled to get the same room as the one he/she used in the academic year 2018/2019. Information whether the student was accommodated or not (application pre-satisfied) will be accessible on iskam-web.vse.cz in the Accommodation – Accommodation requests (waiting lists) by September 5, 2019. Information concerning the particular allocated dormitory and room shall be accessible on iskam-web.vse.cz, in the „Accommodation – Accommodation List” card by September 5, 2019. As the confirmation of serious interest in accommodation in the VŠE dormitory, the applicant shall pay the reservation deposit in amount of CZK 5 000 to the benefit of the bank account no. 1793102/0800 by August 28, 2019 at the latest. If student has paid accommodation deposit and submit application, accommodation deposit will transfer to reservation deposit. The reservation deposit will be transfer at the accommodation deposit on the date of move-in the latest. The accommodation deposit, or its part, may be used to cover any damage, debt or possible sanctions. The deposit will be returned when you move out in cash or by card at the dormitory office, or within 30 days after to the bank account you state in your ISKAM profile (for the foreign payment must be add administration fee CZK 500). The deposit may be also left at your ISKAM account for the next academic year. During the whole academic year 2019/2020 it is possible to apply for accommodation. Every student who is not accommodated can apply for accommodation from August 29, 2019 using iskam-web.vse.cz in the waiting list VŠE Praha studenti 2019/2020 – students 2019/2020. The student of the postgraduate (PhD.) studies, who has not obtained his/her registration data yet, shall send a message regarding the requested accommodation and moving-in date in advance to ubytovani@vse.cz. Student has to pay reservation deposit CZK 5 000 immediately after receiving accommodation (this information will be sent by email). In case that the reservation deposit is not paid until the date stated in that email, the reservation will be canceled. Applications of such students shall be handled individually in accordance with the free accommodation capacities. Information concerning the particular allocated dormitory and room shall be accessible on iskam-web.vse.cz in the „Accommodation – Accommodation List” card. As the confirmation of serious interest in accommodation in the VŠE dormitory, the applicant shall pay the reservation deposit in amount of CZK 5 000 to the benefit of the bank account no. 1793102/0800 immediately after receiving accommodation. The reservation deposit will be transfer at the accommodation deposit on the date of move-in the latest. The accommodation deposit, or its part, may be used to cover any damage, debt or possible sanctions. The deposit will be returned when you move out in cash or by card at the dormitory office, or within 30 days after to the bank account you state in your ISKAM profile (for the foreign payment must be add administration fee CZK 500). The deposit may be also left at your ISKAM account for the next academic year. Students of other universities than the University of Economics in Prague (VŠE) studying in the daily form of studies. Such applicants may register themselves from July 10, 2019 using iskam-web.vse.cz in the waiting list Ostatní žadatelé Praha 2019/2020 – Other applicants 2019/2020. Information concerning the registration procedure and log-in to the system could be found at accommodation.vse.cz/students-accommodation/documents/iskam. Such applicants have no possibility to choose a particular room. The accommodation shall be allocated by the Central Accommodation Office at dormitories at Jižní Město (Blanice, Vltava). Graduates of the University of Economics, Prague must also send a “Application for accommodation approval of VŠE graduate” at the same time with the application for accommodation at the colleges of VŠE at accommodation.vse.cz/students-accommodation/documents/application-for-accommodation-approval-of-vse-graduate. This application is approved by the SÚZ director. If the applicant stayed in the VŠE dormitory in the 2018/2019 academic year, he/she is not entitled to get the same room as the one he/she used in the 2018/2019 academic year. The applications of such applicants shall be handled individually in accordance with the free accommodation capacities. Applicant has to pay reservation deposit CZK 5 000 immediately after receiving accommodation (this information will be sent by email). In case that the reservation deposit is not paid until the date stated in that email, the reservation will be canceled. The applicant for the accommodation returning from study or work internship organized by VŠE should apply for accommodation one month prior to the planned date of moving in. Please use the waiting list VŠE Praha studenti 2019/2020 – students 2019/2020 at iskam-web.vse.cz. You may choose the exact date of moving in in your Application. The Applications shall be satisfied based on free accommodation capacities in the respective period, according to the date and time of the application submission in ISKAM. Rooms are allocated by the Central Accommodation Office about 14 days prior to the planned moving in. Applicants cannot choose a room by themselves. Students at the Faculty of Management in Jindřichův Hradec (FM) file their Applications from May 2, 2019 to June 27, 2019 using iskam-web.vse.cz in the waiting list VŠE JINDŘICHŮV HRADEC – Akademický rok 2019/2020. The application may be filed also after June 27, 2019. However, such persons shall lose the possibility to choose their room; the accommodation shall be allocated by the Central Accommodation Office. The applicants for the accommodation at Švecova dormitory in Jindřichův Hradec are not requested to pay the reservation nor accommodation deposit. Registration in ISKAM is possible only using the user’s name and password allocated for log-in into the Integrated Student Information System (InSIS). Information concerning the registration procedure is provided in the Manual. Only the applicant accommodated in a particular room during the whole period May 1 – June 27 2019 may apply for the same room and their application must be submitted by June 27, 2019 at the latest. At the time of submitting your application, you may not have finished your accommodation! The room will be displayed automatically in the system. If the applicant is not interested in the same room, he/she may cancel this preference in the ISKAM system. If there is not number of the room, student has to contact Central Accommodation Office. The choice of a room by students shall take place in the time determined in the Timetable. The possibility to choose the room shall be provided only to those students who submit their application by June 27, 2019. The Central Accommodation Office reserves a right to change the room chosen. Shall submit their applications in the period from May 2, 2019 to June 27, 2019 using iskam-web.vse.cz in the waiting list VŠE JINDŘICHŮV HRADEC – Akademický rok 2019/2020. During the whole academic year 2019/2020 it is possible to apply for accommodation at iskam-web.vse.cz in the waiting list list VŠE JINDŘICHŮV HRADEC – Akademický rok 2019/2020. Applications shall be handled individually in accordance with the free accommodation capacities, depending on the date and time of application submission in ISKAM. Study results and commuting distance are not taken into account. Rooms are allocated by the Central Accommodation Office. If you find out that you are not interested in the accommodation anymore, please send a “Request for cancellation” via the request in ISKAM. Depending on time of cancellation of your reservation, the deposit will be refunded / non-refunded – see table above.